There is an old saying that youth is wasted on the young. Fans of the Vancouver Canucks may feel that youth has been wasted on their hockey team. The Canucks have not seen a young player take on an important role for them for quite some time now, something that may have to change. With a less than an exciting free agency haul and very few trade chips to play, the Canucks are most likely going to be forced into injecting youth into their lineup this coming season. The Canucks are an aging team to a point and many people blamed the lack of youth on former coach Alain Vigneault. The thought was that Vigneault did not trust young players and was hesitant to give them any meaningful playing time. This may be an unfair critique of the former bench boss as he gave a young Ryan Kesler and Alex Burrows good minutes when he first came to Vancouver and helped develop them into the players they are today. Over his tenure he found himself behind the bench of a talented team with players in their prime. It’s hard to blame him for riding those guys. Times have changed for the Canucks however. The Canucks did not have the cap space to make major free agent moves this summer and don’t have a lot of good trading chips. With a number of holes in their lineup this may be the year a young player steps up. Can you win with youth? There is a school of thought that you need a veteran team to win in the NHL. The Chicago Blackhawks have shown us that this simply isn’t true. They got big contributions from Andrew Shaw and Brandon Saad last year – both players are under 22 years old. Not to mention that Patrick Kane and Jonathan Toews are younger than all but one or two players that suited up regularly for Vancouver last year. It is still very much a young mans game. The Canucks have good veteran players, players who might benefit from having a sprinkling of youth. If the Canucks wish to get past the first round of the playoffs this upcoming season they may have to rely on young players to step up. 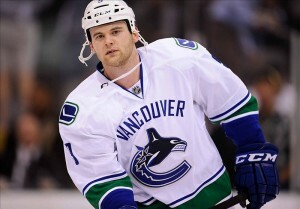 Last year the Canucks youngest regular player was forward Zack Kassian. Kassian has yet to live up to the expectations that were placed on him by virtue of being traded for Cody Hodgson at the deadline in 2012. He is only 22 years old so it is way too early to label him a bust and if he can flourish under John Tortorella in ways he didn’t for Vigneault he could give the Canucks a much needed jolt. He has the tools. He is big, can play physical and with an edge but needs to do it more consistently. There has been some speculation that he might benefit from jumping up to the top line to play with Henrik and Daniel Sedin. This is something that was tinkered with a bit last season, with mixed results. The Canucks gave 2009 first round draft pick, and 22 year-old, Jordan Schroeder a shot at various times last season to solidify himself as an NHL center. The Canucks are still thin down the middle and Schroeder may get another shot in camp to impress, what is now, a new coaching staff. Last year he showed off his great speed but didn’t do enough to keep himself in the lineup on a regular basis. Schroeder was recently re-signed by the club indicating that he should have a shot at earning the third line center spot in camp. The most likely candidates to step up? 20 year-old Nicklas Jensen and 19 year-old Brendan Gaunce. Jensen and Gaunce are the Canucks 2011 and 2012 first round picks and one of them most likely will break camp with the club. Jensen got a brief look last year when Vancouver was desperate for forwards due to injuries. While Jensen may have an edge in age and experience over Ganuce, he plays on the wing – where Vancouver has less of a need. Gaunce is a center but is he ready to make the jump? 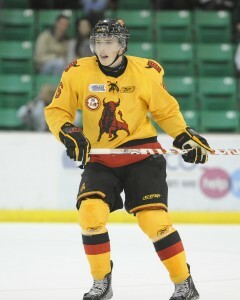 After being drafted by Vancouver he returned to the Belleville Bulls last season and potted 33 goals. It will be interesting to see how he performs in training camp and if he shows that he is ready to make the jump to the NHL or not. Is Gaunce ready for the NHL? After Henrik Sedin and Ryan Kesler the Canucks pool of centers is less than desirable – giving Gaunce a good shot at getting ice time. For the first time since Mike Gillis has taken over the club the Canucks managed to draft two highly rated prospects this past June. Is there a chance that Bo Horvat or Hunter Shinkaruk end up in camp with the Canucks? It seems unlikely that either player will take the leap at only 18 years-old, but stranger things have happened. Horvat would seem to stand the best chance as he plays center and probably has the most well-rounded game between the two. Shinkaruk stated all year last year that his goal was to be in the NHL this season but sliding down in the draft the way he did makes it seem unlikely. Still, if he shows that he has the physical chops to handle the bigger players and can score in camp he might get a look. When the Canucks open their training camp later this summer it will be the first time in several years that a young player will have a legitimate chance to make the team. Not only will that player, whomever he ends up being, make the club – he will be asked to contribute. Can Kassian, Gaunce or Jensen take a step and give the Canucks a spark the way Chicago’s young players did this past year? For Vancouver to be successful, they may have to.